The Lakeland Arts Trust was awarded a grant of £2,000 from the Westmorland Arts Trust to support a programme of summer activities at Abbot Hall Art Gallery in Kendal. 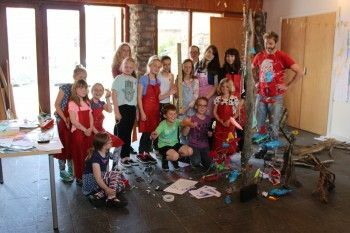 The activities included a week long ‘Art Camp’ for 9-15 year olds, three artist-led family workshops and an abstract painting workshop for adults. The activities used the Lakeland Arts summer exhibition, ‘Taking Flight: St Ives in the 1950s’ as inspiration. The exhibition showed how St Ives became home to a group of artists who elevated painting to new heights of vivid expression. The Lakeland Arts Trust wanted to give local people the opportunity to engage with their exhibition and learn more about the arts. Participants worked alongside professional artists, using a range of media to experiment and explore movement and artistic processes. Following on from the success of the summer workshops, The Lakeland Arts Trust have continued to hold Saturday events throughout the year. They are also planning another Art Club for this summer.